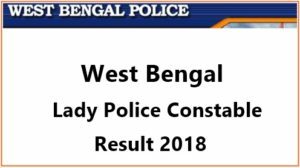 The WBPRB (West Bengal Police Recruitment Board) released the results for the exam that was conducted to fill up the post of Lady Constable in the West Bengal Police in 2018. All the applicants who took the exam can check the results by clicking on the link that is available below. The candidates are requested to fill up the necessary requirements in the application before it will show you the results. The second step is: Click the final result button for the FINAL RESULT FOR THE POST OF LADY CONSTABLES IN WEST BENGAL POLICE, 2018. The third step is: You will have to enter your application number and your date of birth. The fourth step is: Submit it and you will be redirected to a new page where you can see your result. When filling up the required details make sure that you enter them properly. Double check the format of the date of birth before filling it up, usually it’s in dd/mm/yyyy format. The WBPRB (West Bengal Police Recruitment Board) is also accepting applications for 8419 Male Constable vacancies in the West Bengal Police. The application will last until March 5, 2019. The selection will include a 5 stage process. First the WBPRB will let the applicants take a written exam, if the applicants pass the exam they will be called for a PMT (Physical Measurement Test) and if you also pass this test you will be called for a PET (Physical Efficiency Test) that will make you run 1600 meters in 6 minutes and 30 seconds.